The comedian and Radio X DJ has discussed the Irish singer's heart-wrenching Facebook post on her struggle with mental illness in his latest Trews episode. 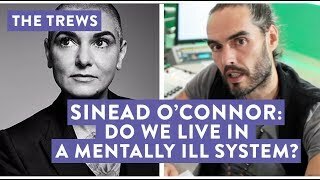 Russell Brand has discussed Sinead O'Connor's heartbreaking video in his latest Trews episode. Last week, the 50-year-old sparked concern, after she shared a distressing clip from a New Jersey motel on her Facebook page, which candidly and emotionally detailed her ongoing battle with mental illness. Now, taking to YouTube, Brand has discussed the relationship between mental illness and celebrity, and urged his followers to hope and pray for the star. Watch his video here, which contains some distressing language above. The comedian commented: "It's interesting to look at this in the context of the career that Sinead O'Connor had. She was a very beautiful, searing person with the great gift of this voice, but always accompanied with a kind of intensity, the moments of controversy. "Clearly she's a person that's been conflicted, and as we've said before: How could you not be conflicted in this world? There are so many conflicting messages." He added: "I've noticed a lot when dealing with people that have got self-declared mental issues, that they are seemingly quite sensitive and intuitive, a little bit raw. They've exposed a lot of their gift to the world, and I think it can be a hard thing to carry." He concluded: "I suppose ultimately we have to hope, pray in fact, that Sinead O'Connor gets better, and that the world gets better". Brand's video comes after singer-songwriter Fiona Apple shared a video of support for O'Connor, describing her as a "hero". Meanwhile, according to The Metro, the Irish singer has posted a second video confirming she is back in hospital, describing her latest ordeal as "unbearable," but insisting she is being treated well.